It was D-day at last. The time had come to face the music, to see how the training, the race plan, the nutrition plan and the material would hold. The time had come to see whether I would have to double the money raised for my charity action with Malaika Kids (see banner). The start was planned at 05:45. It was not before 05:25 that I walked to beach, my swimsuit on. FIrst surprise of the day, the sea was not calm as forecasted. LIttle waves rolled on to the beach and it meant, that 2km outside in the ocean it would be a very different story. I did a quick warm up 200m and went back to the beach. Off the gun goes. As expected, a choppy swim to start the Ironman Western Australia with up to 25-50 cm surf. The Official distance: 3900m to go around the beautiful and longest jetty in the Southern hemisphere. I mentioned in a previous blog post, that I dropped the ball on the swim training to concentrate on the bike and that I may regret it 2000m into the swim. This is EXACTLY what happened. I needed just 33min to reach the end of the Jetty and thought I was doing great in the waves, but I did not realise there was a slight side current. The way back was exhausting and I had to fight my way back to the shore. The time reflects my training. Finished 602nd!!! in 1h11min. from 1515… hopla. After a relatively quick transition of 4min, I unracked my bike for an official 182km ride around Busselton and into the scenic Tuart Forest National Park. As mentioned earlier in my blog as well; a beautiful course but exposed. And today the wind blew up to 35km/h for the first 4 hours before starting to fade. For someone who trains in the Netherlands, this was an advantage. Everything went perfectly to plan. The nutrition plan worked this time and I negative split every 30km feeling stronger and stronger. Moved from overall 605 to 444 position. I really wanted to hammer the last 30km, just to beat the clock and manage the course under 5:30. But I kept a cool head and instead cruised to transition 2 in a time of 5h34m. The temperature during the bike leg between 24 and 29 C. Ideal! Again plenty of inspirational moments on the bike, as you can see on the picture. I finally pass a hand-biker after 120km!!! This also meant, he was ahead on the swim, just working with his arms…humbled. Another transition to put some running shoes and a ton of sun cream. Here the only big change versus plan. My little left toe was hurting for a couple of days so I chose to wear a pair of Mizuno Wave4. The advantage: a bigger toe box and super light weight (154gr). The issue: a super light weigh shoe ideal for a 10k run on fresh legs…(This will be a subject for a separate blog post but in short I would not recommend to run a marathon in those shoes and definitely not on hot roads). Because that run was a real scorcher. The wind had died and the temperature had raised to 32C. No cloud, no shade on black roads along the shore. At this time, after feeling real strong on the bike I thought, that a 10:30 was possible so I deviated from plan and ran 15 seconds faster (5:00 instead of 5:15 pace per km). But the heat got the best of me and instead of negative splits I faded in every single round of the 4 course loop. The other competitors had obviously more issues with the heat than me. The last 10km were trying. I was running on dead legs with blistered feet from the heat and trying to keep cool by storing ice, where ever I could and drinking liters (literally) of Coke to keep to body going. I finally saw the 41km mark. 1.2 km to go! My wife and daughters, who had shouted words of encouragement for the last 8 hours or so, shouted even louder. This gave me enough energy to motor my way to the finish chute, with the knowledge that I would beat the clock and indeed race as planned under 11:00. 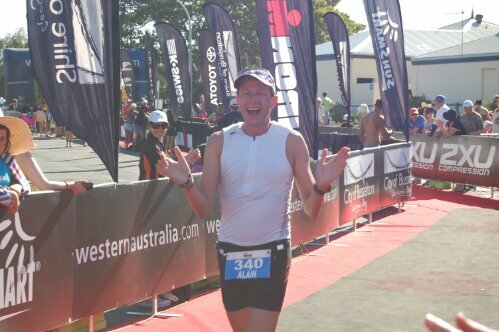 The commentator at the finish line said: ¨…and here comes a very happy Ironman¨. I was indeed over the moon and I came across the finish line laughing out loud. I did not assess properly my level of exhaustion. Within a few second my legs decided to sail without the rest of my body and I collapsed into two so called ¨catchers¨ (who decide whether you go directly to the massage, the medical or the recovery tent). Thanks goodness they brought me to the recovery tent for drinks and food (and not for an iv). So the final result: I move with a marathon time of 3:44 from 444 to 227 rank overall (1510) and 45th in my age group (first15%). Happy with the overall result. A PR by exactly 1 hour. Total time 10:38:59.6 So many things could have gone wrong and racing so far from home was a risk….but all went well. What difference it makes whent the family is along the course, following your every meter and getting the best support you can wish for. 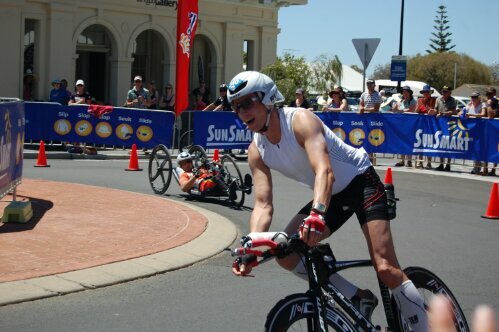 Next IronMan, June 29th with my buddy Joel in Klagenfurt, Austria. The nerves are kicking in… The 1000 questions and scenario how things could go wrong hit home….but actually, it is too late too worry now. The bike is racked in transition zone, the transition bags are hung in the transition areas, the training is done, it is actually all about not worrying and relax AND enjoy. 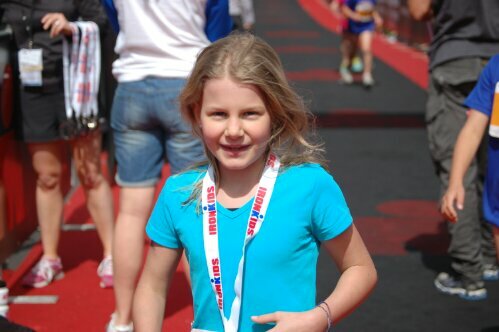 Well…that is easier said the done, but there are 2 things that helped me taking my thoughts of the race: The talking with fellow athletes and Pros as well as my daughter participating in The IronKids Race. 1. I met some very inspiring people: a 60-65 lady age grouper, who answered me after asking her what was her goal for this race. She said ¨this year is all about not getting a glow stick before the finishing line¨. A glow stick is something you receive after darkness as settled over the running course in order for the helpers to identify the athletes still in the race. I hope I will also be fighting the glow stick receival at 60! 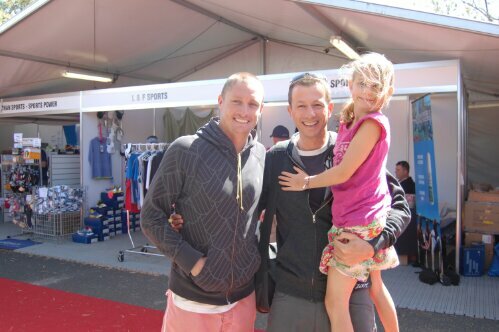 I also met Luke McKenzie and his wife. Luke is a 5 time Ironman Champ, 6 time Hawaii finisher (ranked 9th in 2011) and is currently 37th on the 2012 IronMan Pro Ranking Male (http://www.lukemckenzie.com). We chatted for about 10 min. Totally relaxed accessible pro (like many others). He took time to give me some advise on the course, his wife was playing with our kids, etc.. There is just no other sport where pro, all age groupers, male, female, disabled, etc…are all racing together at the same time and share the experience in such a way. The 3rd person is Paul Perrett. He lost his father at the age of 13 from skin cancer, took on weight up to 130kg, became a chain-smoker and workoholic on the border of exhaustion. Then he realised ,that he would not re-produce the same story and have 3 fatherless kids. 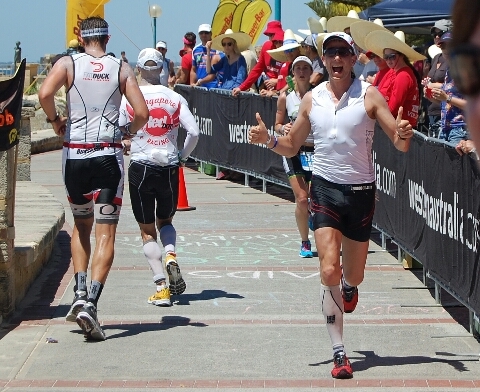 So, he got out of his couch (and office chair) and started training for Ironman. What made it more difficult is that he was born with clubbed feet. Multiple operations left him with a big challenge to run, but he still did took on the challenge and finished his first Ironman a year ago. We checked in together and I will drive tomorrow morning with him at the start (planned at 5:45…aaaarrrghh!). What willpower (not the early wake up part…)! Simply Inspiring. 2. 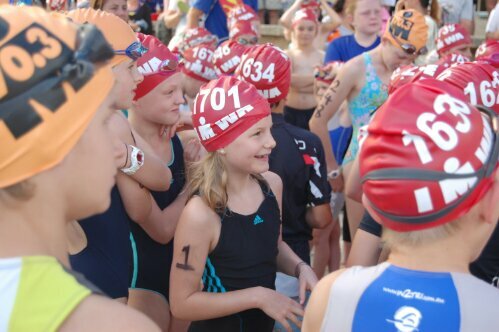 We supported our older daughter to start her first triathlon. At the beginning, she was not sure whether it was a good idea but she gradually became more and more excited as the day came. 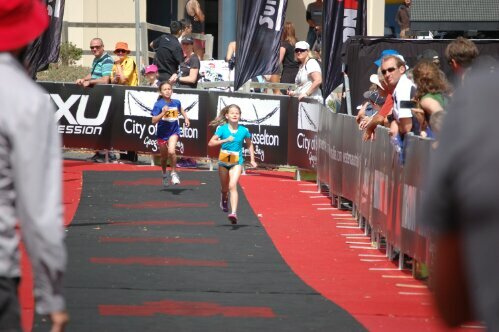 IronKids age limit is 7, so she was one of the youngest in the race and she did awesome as you can see in the pictures. The swim was the toughest piece for her. Surrounded by Aussie kids, most of them butterflying their way out of the womb, it was difficult to compete,. Once one the bike though (after a very comfy break in transition chatting with her wonderful helper), she was flying, overtaking a few and giving it all. The run, like dad, was her best discipline. A dash from start to finish under the real arch of the Ironman finish chute. She finished as her starting number indicated: As number 1 in Mom’s and Dad’s heart. We are so proud of our daughter. 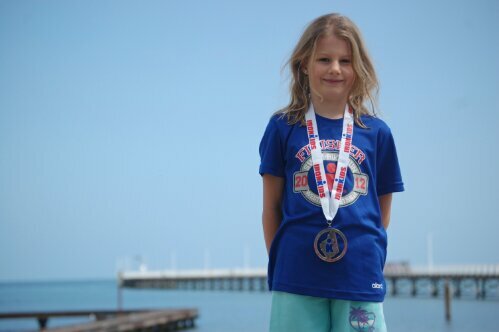 She cannot wait to go back to school after the break and show here finisher T-shirt and her medal to all her 1st grader friends (a special greeting to Ann and her class here!). We finally arrived to our destination. 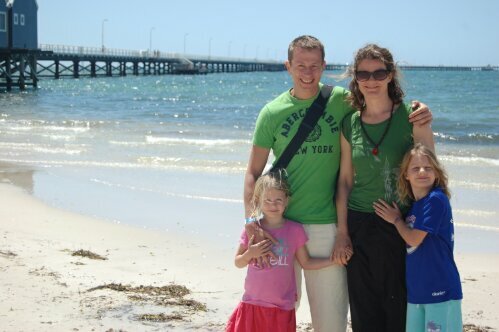 It took us 4 days to fly from Amsterdam to Singapore, Singapore to Perth. 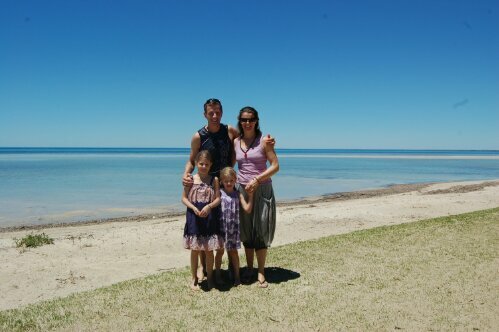 Rest for 2 nights in Sorrento (North of Perth) and then travel from Sorrento to Dunsborough (20km South of Busselton). Dunsborough is a very laid back location on the coast of the Geographe Bay. Its beach is considered to be one of the top 10 beaches in the world. As far as we can tell, it could be true. 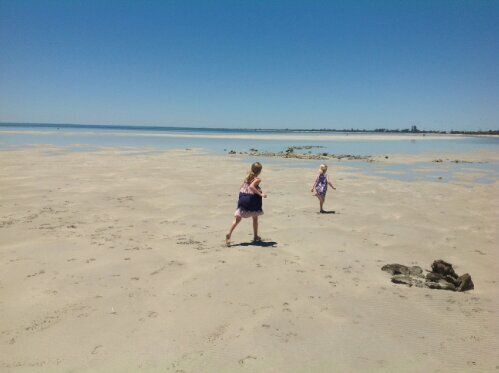 It did not take our girls long to discover the fun of a low tide. Hopping from one sand bank to the next, catching small shells, jumping into deeper pools of water. SO, it is not all about the Ironman? Definitely not: what an unbelievable feeling to be back in the Summer, living outdoors, looking forward to a cold shower to wash the salt away. Isa is soaking the sun in. Zoe told us she likes the place because it is so wonderfully hot and everything is so quiet. Dunsborough reminds of Hanalei on Kauai. Beautiful beaches with surf possibilities, great yoga places with organic food.. a slow-down-relax-breathe kind of place. 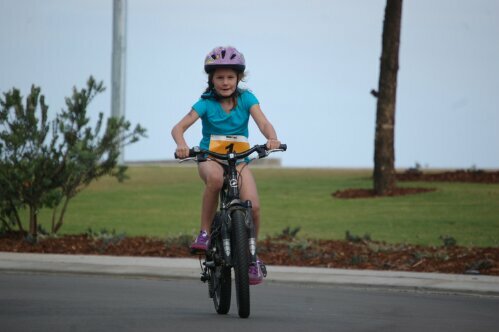 I went to Busselton this morning for a first ride to check out the course. First impressions. Gorgeous course across The Tuart Forest National Park (50% of the total course), the rest of the course is exposed to prevailing South West Winds and has a remarkable absence of shade. Temperature this morning at 11:00, 31.5 degrees. Oh yeah. Despite the wind, I could keep a good pace at a very low HR. It is so much tougher to ride in the cold-wind-bashing green heart of The Netherlands. It feels that I can cut right through the wind here…. Anyways, it also felt great to see other participants. I usually feel pretty lonely mostly riding solo back in The Netherlands. 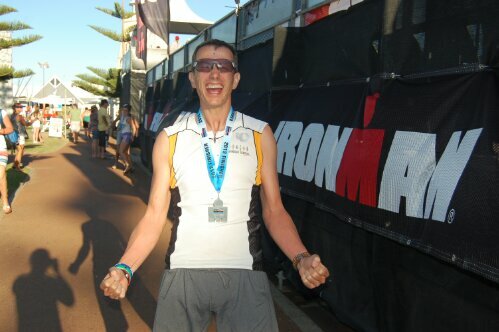 The Ironman in Busselton is definitely a big thing here. EVerybody talks about it. You hear about it on the radio, there is a special edition of the local newspaper, everybody cheers and say hi when they see you on the bike. People understand what we do and do not consider those strange bikers with tailed helmets as aliens. It is a great feeling for a change adn definitely a great place to race. I CANNOT WAIT!!! ETU – European Championship Half Distance Triathlon- or how sometimes it is just about getting to the finish line, no matter what. Violent Storms & Peaceful Dawns Blog at WordPress.com.